How to Grind Your Own Meat At Home Using Your Electric Meat Grinder? How is the idea of keeping your own electric meat grinder at home? Yes, because it allows you to prepare a wide range of dishes in the comfort of your own kitchen. You can easily make mouth-watering and palatable homemade dishes with all the love and affection, for your family members. A Top Electric Meat Grinder is always all equipped with an assortment of attachments that can be used for specific needs. Also available in a manual variant, most people prefer to use only electric meat grinders than the manual ones. Both the ease of usage and the presence of varieties of models in the electrically operated meat grinders make for this preference. Beyond the sole purpose of grinding meat, the electric meat grinders can also be used for slicing of nuts, cheese grating, shredding and chopping of vegetables and fruits, etc. By getting one of the leading electric meat grinders, you can finish off your kitchen work in minutes and provide your beloved ones with the most delectable dishes in the shortest possible time. We get hygienic, ground and minced meat from our own kitchen. In pre-packed beef or mutton packs, you may find contaminations in higher concentration. The frozen pack may contain thousands and thousands of animals and also unnecessary bits. In homemade minced meats, you cannot find such abnormalities. When you get to buy minced meat as a packaged food, you cannot control the fat content in it and hence the perfect flavor may be missing. But, in the meat which you grind in your electric meat grinder, you would have better control over what specifically you would like to have. The packaged meat is compressed and oxidized for its longer shelf life. In that case, these meats are less fluffy and less soft when cooked. At the same time, the meat ground in an electric meat grinder, would be fresh, loosened and offers you the perfect texture when cooked. Maybe it is for burger patties, juicer sausages or ragu, you would definitely hit those varieties of perfect recipes to its best. Right from its texture, flavor, and safety, all can be attained in one shot, when you make use of these electric meat grinders for preparing dishes in your kitchen. 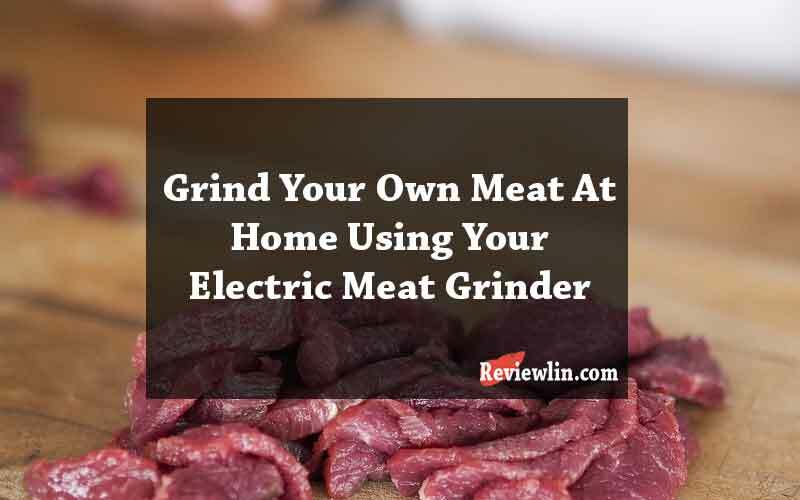 Here are the few simple and efficient steps to grind meat in your kitchen using the electric meat grinders. Keep everything refrigerated until you start grinding. Both the meat and the grinder along with its parts should be chilled before you start up the job of grinding. This makes you even the tough meat with fat tissues, to easily pass through the grinder without making the ground meat pulpy and pasty. To avoid getting the bits of sinew wrapped around the blade and not to get the chewed-up texture of ground meat, you must trim your meat well before grinding. If you find the ground meat to be like a wet mass and accumulate on the surface of the die, you should use the reverse function if available, or you need to disassemble the entire mechanism of the grinder. Make sure you keep the blade sharp, and of course the plates clean. Place the meat pieces on the tray given, and then switch on the grinder. Once when the grinder runs, start pushing the meat pieces inside it. And watch for smearing constantly. The ground meat starts collecting on the plate given. Use larger die first when you need ground meat for sausages or hamburgers. And then make use of the smaller die, to grind the same meat for the second time. You may also use salt or spices along with the meat while grinding. When it is time to clean, first insert few wadded-up paper towels inside the grinder when it is switched on. It cleans the grinder from inside, throwing all the leftover pieces of meat out. And for the rest of the parts, you can make use of liquid soap and water to clean thoroughly. Do you want to buy a new meat grinder? Well, check these before you buy. Opt for the suitable power source- Decide the perfect need according to your purpose and other such criteria like space availability, capacity, and usages. Hence, you could select the suitable model with appropriate power consumption like 200W, 250W, 400W and even 500W. Make sure it is durable- The grinders available in the market have an outer body made of stainless steel, molded plastic, and aluminum too. Choose the best one to offer you the unparalleled usage throughout the years. Choose Stainless Steel – It is good if you go with the electric grinders made with stainless steel parts and attachments. Since these stainless steel accessories do not rust, they do not give the chance for food contamination. Check for the Ease of Use and Cleaning- If you do not opt for the best one for easy cleaning and easy utilization into your kitchen, you may end up in wasting your time and money. Check for the Accessories- Common attachments in most of the models available are the stainless steel grinding plates, fine and coarse shredders, sausage stuffing tubes, slicers and a grinding tray. Make sure that you would definitely have sustained usage of all the accessories provided. And then, go with the model you have chosen. Do not forget the available space- There must be sufficient place for the grinder to fit in your kitchen and work efficiently with no hazards. You get different models that can be customized to suit the needs of both nuclear families as well as larger families. Electric meat grinders are versatile for home processing of meat and other chopping requirements. So don’t wait anymore, just go and purchase the best electric meat grinder model that matches all your needs.